Successfully Added CREE LED Flashlight And Powerbank - 350 Lumen, 700K Light, 2200mAh Battery, USB Port, Back Lit Button to your Shopping Cart. With a 320 to 350 lumen flash light that emits a 7000K white beam this torch can throw its light up to 250 meter away and being just 13.5cm long by 2.5 cm wide this portable mini flashlight is ultra small and very light weight making it easy and discreet to carry in your pocket or purse. 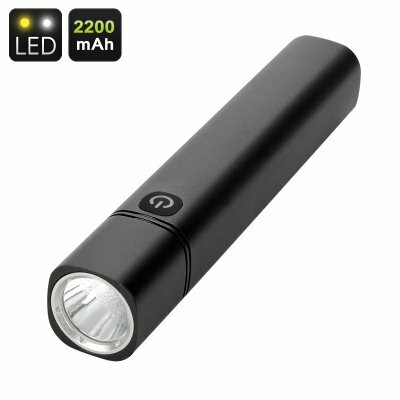 A stylish design encapsulates two functions as this multiuse gadget combines a Cree Flashlight with a 2200mAh rechargeable battery that lets it double up as a power bank so you charge your phone or other portable device. When used strictly for illumination the 18650 Li-ion rechargeable battery can power the Cree flashlight for as long as 10 hours and is activated by long pressing the power button for 5 seconds. To use the battery as a power bank just plug a USB lead into the base of the torch which also houses the mini USB recharge port. So if your phone ran out of juice or you want to give your music player a boost then no problem, just connect it to the flashlight and you’ll be going again in no time! The backlit touch button will also change color from green to orange and then to red indicating the state of charge remaining in this cigar case shaped multifunction flashlight and power bank. This product is in stock now, we guarantee next working day shipping and offer a 12 months warranty on all our products. Brought to you by the leader in electronic devices as well as wholesale gadgets, Chinavasion..